Have you ever wanted to create a blog of your own? Are you completely clueless when it comes to computers? You've come to the right place! I recently did a PowerPoint presentation on this subject and instead of doing handouts, I offered to post the whole thing here. Lucky you! My presentation was fairly lengthy - thirty-two slides, to be exact. To keep from overwhelming you, I'm breaking it up into three posts and posting them as soon as they're compiled. And because I hate a long preamble leading to the good stuff...here we go! 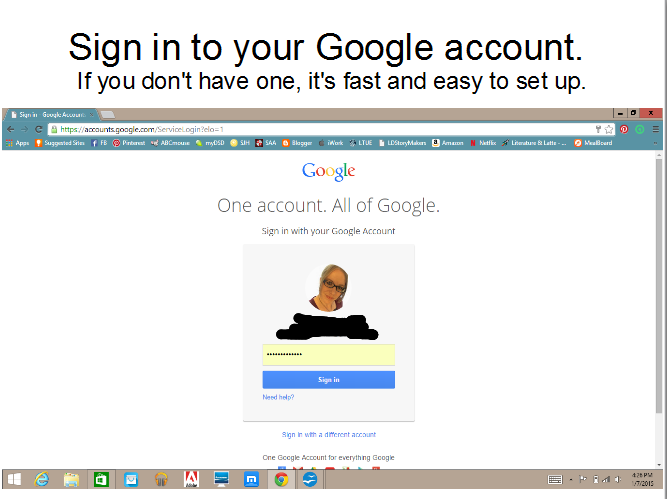 I'm not going to get into creating a Google account here. Maybe in a future post. 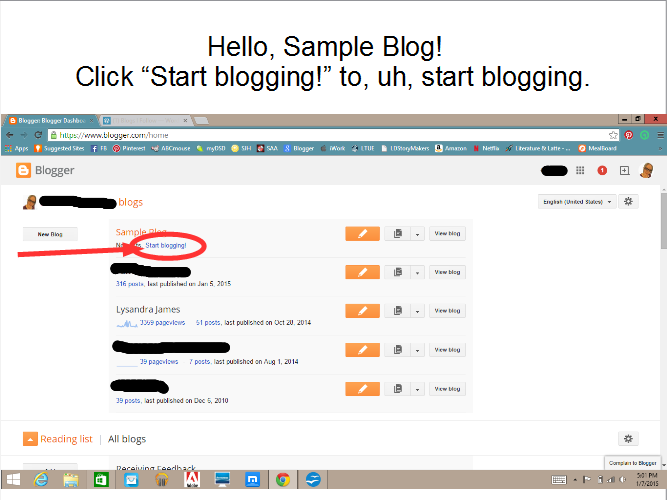 All you need to know right now is any free blogging site is going to make you sign in. Why not sign up with Google? Free email address, access to Google Calendar, Google Docs, Google Drive, and more and you only need one password. Don't you love my high tech editing? 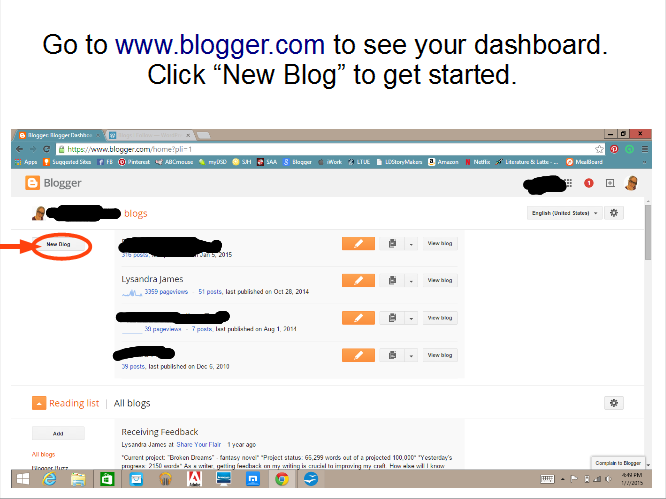 Since I already have multiple blogs, my dashboard may look different than yours. The key thing you need to find is a button or link for a new blog. Mine is on the left toward the top. See the fancy red arrow and circle? Right there. 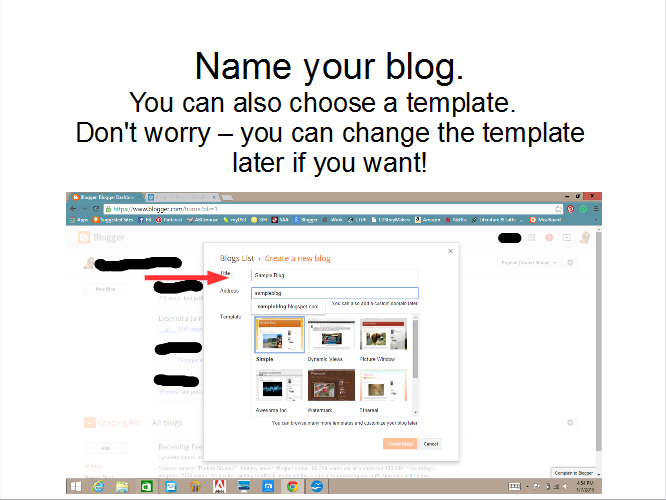 You can name your blog anything you want. "Momma's House of Bacon", "Help Me, Rhonda", or simply "My Blog" - anything goes. If you decide you don't like the name, you can always change it later. Pick a template. Again, it's easy to switch it out if you change your mind. Blogger just needs something to display when your blog pops up. I'm so creative with my naming here. To educate the computer illiterate - the domain name is the web address you type in to get to a web page. Mine is www.lysandrajames.com. When you create a blog with Blogger, you need a unique name to identify your blog's location in the world wide web. Your domain name will end with "blogspot.com" since it's a free account. If you want to pay for a custom domain name without the identifying tag, there's tons of websites - including Blogger - that will accommodate you. 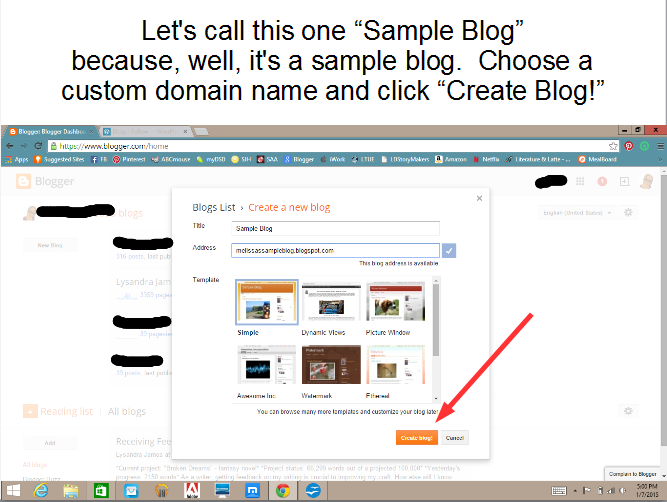 Once you come up with your custom domain name and Blogger tells you it's available, click "Create Blog!" You can't change this later on, so pick something you like. It doesn't have to be the same as your blog name. Doesn't it look lovely there on the dashboard? So official and stuff. As you gain followers and start getting stats, they'll show up under your blog name. You'll also get notifications when someone comments on your blog or starts following you publicly. And that's all there is to creating a blog! Fast and easy. Next up: "How to Post to Your New Blogger Blog" where I'll show you how to post text, pictures, and links to your baby blog.